A wall mural in Damascus "to send a message to the world that we Syrians love life," says the lead artist, Moaffak Makhoul. Credit: Eva Bartlett/IPS. DAMASCUS, May 12 2014 (IPS) - On a weekday afternoon, the Old City of Damascus heaves with people, cars, motorcycles, bikes. Markets are crowded with locals bartering with merchants for the heaps of spices, flowery perfumes, clothing, and most things one needs, abundant in the Hamidiyah market. At the end of the historic Roman Via Recta (Straight Street), boys play football amidst ancient columns. Syria, in its fourth year of a devastating foreign-backed armed attempt to overthrow the government, is somehow still pulsing with life and hope. In the narrow back lanes of the Old City, couples walk hand in hand, older men greet each other with broad smiles and a kiss on each cheek. Music wafts from open doors of ancient homes, their courtyards bursting with greenery. A milkman delivers milk from large tins strapped to his bicycle. But the spacious old homes converted into hotels or restaurants now have no tourists. Various shop owners highlight the same issue: they have goods, but no buyers. Bassam runs his family’s antiques and jewellery store, Giovanni, near the East Gate entrance to the Old City, in an old Damascene home with vast arches and ornate wooden décor. “Business is not very good, because of the situation. Many people used to come here.” He picks up a framed photo of himself and a woman in his store. “That’s Catherine Deneuve, a French actress. She’s very famous,” he says, reiterating that well-known people from around the world used to frequent his store. Inside the Umayyad Mosque, worshipers pray and relax in the cool interior, a boy twirls Sufi-style through the mosque. Outside, women sit in the courtyard shade with their children, picnicking on sandwiches. The vast square opposite the mosque is filled with food vendors, clothing vendors, families milling about, kids selling roses. Children gather around a hoard of pigeons, buying feed to toss to them. Almost daily, armed groups launch mortars on civilian areas in Damascus, from villages on the outskirts like Jobar, Mliha. On Apr. 15, mortars struck Manar elementary school, killing one child and injuring 62 others. A kindergarten was also shelled that morning, in the same densely-inhabited area of Damascus, injuring three more children. On Apr. 29, the mortars struck Bader Eddin al-Hassni Institute for religious science, killing 14 students and injuring 86 others, according to SANA news. As I sit outside the old city walls one afternoon, roughly one hundred metres from East Gate, bullets whiz closely past, coming from the direction of Jobar, an area controlled by armed groups. Due to attacks on civilians, including car bombings, checkpoints are installed throughout Damascus and the countryside, causing long lines of traffic as soldiers check vehicles for explosives. But without the checkpoints, there would be more loss of civilian life. Homs residents know all too well the deadly effects of the car bombings. On Apr. 9, for example, two car bombs detonated one after the other on the same residential street, killing 25 civilians and injuring at least 107, according to Syrian state media. On Apr. 29, two more car bombs and a rocket attack killed another 42 civilians in Homs. But Homs is also a place where the reconciliation movement has taken flight, with fighters nearly daily laying down their weapons and opting for a political solution for Syria. In Latakia, a coastal city roughly 350 km northwest of Damascus, near the Turkish border, internally displaced Syrians from the Armenian populated village of Kasab take refuge in an Armenian Orthodox Church. On Mar. 21, armed groups began firing missiles from nearby Turkey upon the village, later entering and taking it over, committing atrocities against the civilians. Eighty people are reported to have been killed, and nearly 2000 villagers fled to Latakia and other areas to escape the attacks by a reported 1500 Chechnyan and other foreign, al-Qaeda-affiliated insurgents, backed by Turkish special forces. Elsewhere in Latakia, a city secured by the Syrian army but attacked from a distance with missiles, children and teens play in a fountain in a large, clean park, and men and women sit smoking shisha or hookah and chatting. This is a point Lilly Martin, who is from California but has lived in Syria for the past 22 years, drives home. “At the beginning, we had a surge of violence, protestors attacking Syrian police and security, but right away the Latakian people turned against it. The population here didn’t accept it. We have Christians, Muslims, and minorities here. There is very little support for the ‘rebels’ here, so it’s been a peaceful city,” she says. In Homs, Latakia, Damascus, walls and shop doors are decorated with large, painted replicas of the Syrian flag and posters of President Assad. Syrian flags appeared at Easter celebrations, wedding receptions and engagement parties. And along with the flags, there are patriotic songs for Syria and President Assad, with a roomful of celebrants singing along, hooting and clapping. On the Autostrad, the main street leading to the al-Mezze district of Damascus, a block-long mural brightens the otherwise standard wall surrounding a school. 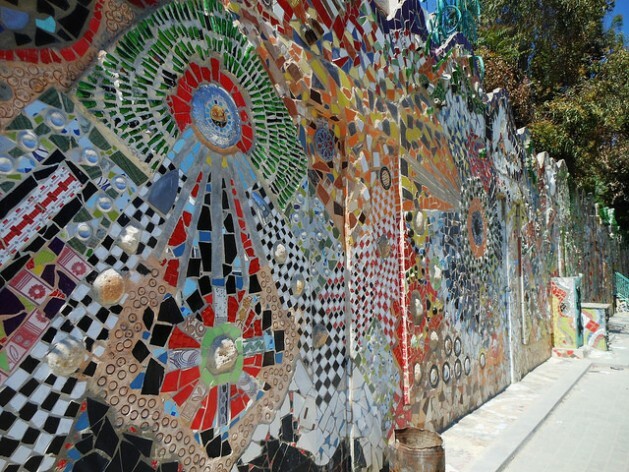 The colourful mosaic of scraps of tiles and recycled items is the project of six artists. Moaffak Makhoul, the lead artist, explains the concept. “We did this for the children, to bring a smile to their faces. And we wanted to send a message to the world that we Syrians love life, and that we insist on living, on surviving,” he says. The call to prayer sounds, church bells ring out, in a city and country where life goes on despite it all.